Barbie turned 50 this year and is still looking as fabulous as ever. The first ever Barbie (above left) which hit the shelves March 9, 1959 wearing her iconic black and white swimsuit has developed into a very sophisticated fashion muse. 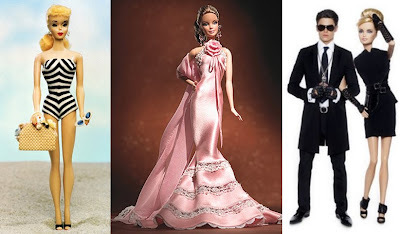 To celebrate her 50th birthday Karl Lagerfeld has designed an amazing collection (above right Barbie with real-life model Baptiste Giabiconi as Ken).